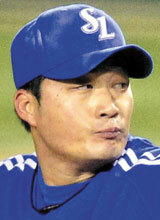 Hanshin Tigers' manager Yutaka Wada has recommended his players pick up some basic Korean in order to better communicate with their new teammate after the Japanese club recently signed Oh Seung-hwan, previously a closer for Samsung Lions. Japanese media reported on Sunday that Wada told a gathering of Hanshin players and coaches one day earlier they must learn some of the language to help Oh adapt and quickly fit in. He was cited as saying, "I think everyone should know how to make simple greetings in Korean at least, while the catchers and pitching coaches who need to communicate directly with [Oh] should know more of the language." The Japanese manager also suggested offering some Korean-language classes for his players. Hanshin have high hopes for Oh and have promised to give the player their full support, including interpreters and housing. Oh will officially join the club at an event in Seoul on Wednesday.